Melons are part of the gourd family. Watermelons, honeydew and cantaloupe are the most common varieties, and although grown mainly in the summer months in the United States, you can often find imported melons year-round. Other less common varieties include the casaba, Crenshaw and Persian. All melons are naturally low in calories, high in vital nutrients and can help you in a variety of ways while you try to lose weight. Reducing your calories and limiting the amount of processed sweets you eat can help you lose weight. Unlike processed desserts, melons have naturally occurring sugars, which help satisfy your sweet tooth and may enable you to resist eating high-calorie, less healthy desserts. A publication from the Centers for Disease Control and Prevention indicates that fruits such as melons can help you both lose and maintain a healthy weight. Melons such as cantaloupes, watermelon and honeydew are a low-energy density food. Foods with low-energy density offer you few calories within a larger volume of food. Watermelon, cantaloupe and honeydew have 46, 53 and 61 calories per 1 cup of diced fruit, respectively. Choosing melon as a side dish in place of light, canned peaches saves you 81 calories. The higher water content in melons helps you stay full, which can help you control the amount of food and calories you eat while losing weight. Additionally, physician Arne Astrup and author of a study published in the September/October 2008 issue of "Journal of Parenteral and Enteral Nutrition" indicates that foods with low-energy densities and low fat content can help reduce weight and the risk of developing type 2 diabetes. The nutrients in melons are an important part of your diet, as melons contain both vitamin C and vitamin A. Cantaloupe contains the most of both vitamins, with 56 mg of vitamin C, and 264 mcg RAE of vitamin A, which is about 30 percent of a male's vitamin A requirement and 37 percent of a female's requirement. Other nutrients in melons that can help you eat a balanced diet while losing weight are potassium, folate, selenium and choline. The 2010 Dietary Guidelines advise that adults eating between 1,400 to 1,800 calories a day need 1 1/2 cups of fruit each day to stay properly nourished, both while dieting and during weight maintenance. When you substitute low-calorie melons for higher calorie foods, you reduce your caloric intake, which is a requirement for losing weight. Eat 1 1/2 cups of melon and 1 cup of Greek yogurt for a breakfast under 200 calories. Use 1/2 cup of melon as a morning or afternoon snack. 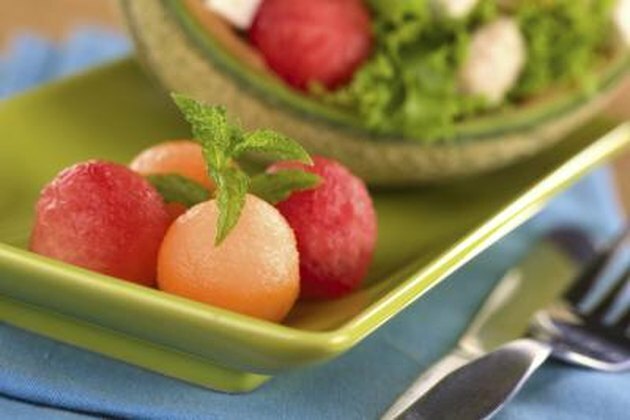 Combine the melon with other fresh, cut-up fruits for a fruit salad or as a topping for fat-free ice cream or yogurt. Although melon can help you meet your weight-loss goals, avoid eating melons exclusively, as your body needs protein from meat or beans, complex carbohydrates from breads and vegetables, dairy from milk products and healthy fats.